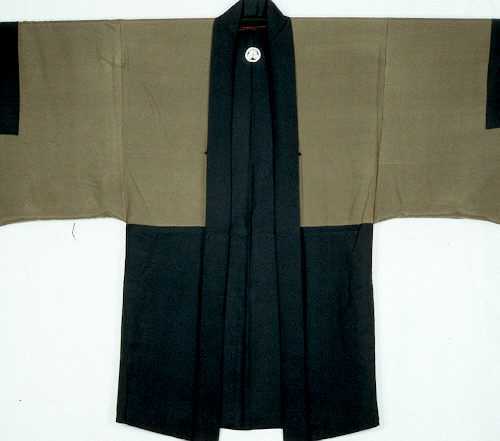 This is an exquisite example of a Japanese Man’s “Haori” or formal topcoat. 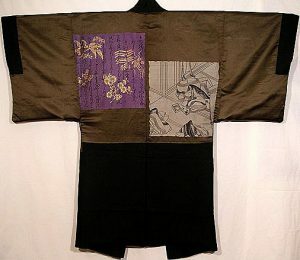 It is entirely handmade, totally reversible and has represented the height of formal ware for Japanese men for centuries. 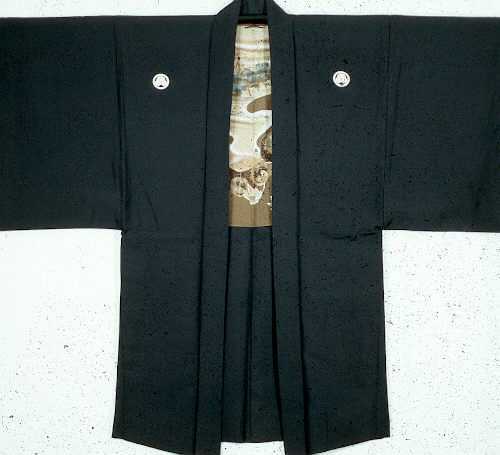 The outer layer is a high quality, solid black Silk with the exception of 5 white circles within which a pictorial symbol of the family crest or “Mon” appears (bottom photo). 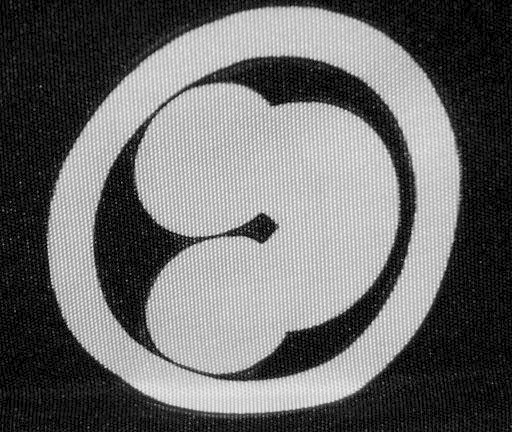 The crest is that of the “Suhama” or sandbar. 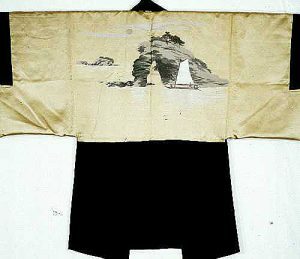 It was a fashionable pattern in the Heian period, suggestive of a beach or sandbar and so appropriate for the owner of this Haori. 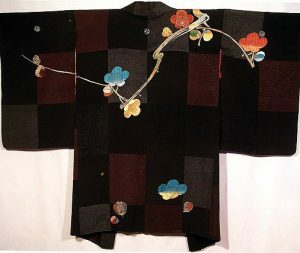 What makes the Haori so intriguing is the fact that the main source of decoration is on the inside of the garment (shown left), or lining. 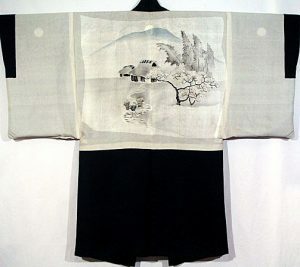 The inner back panel of this Haori has been hand painted, using natural dyes, in the labor intensive “Rice Paste Resist” technique. 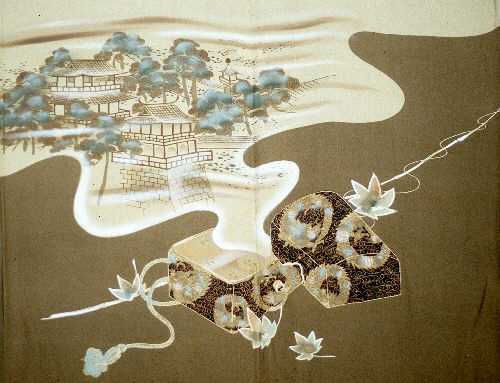 The artwork centers on the legend of Urashima Taro, the fisherman who went to the Dragon Palace at the bottom of the sea. There he married a Princess who gave him a box with instructions not to open it when he returned home, or he would not be able to come back to her. He was so surprised to see his own grave, when he returned to land, that he opened the Box. In doing so, he turned into an old man and died at his grave site. He had been gone 300 years, not the 3 he had thought. The Dragon Palace, the Box and Urashima’s fishing pole are all represented here. This marvelous Haori, with its captivating story, would have belonged to a man of great wealth and status whose main interest lay in the sea. 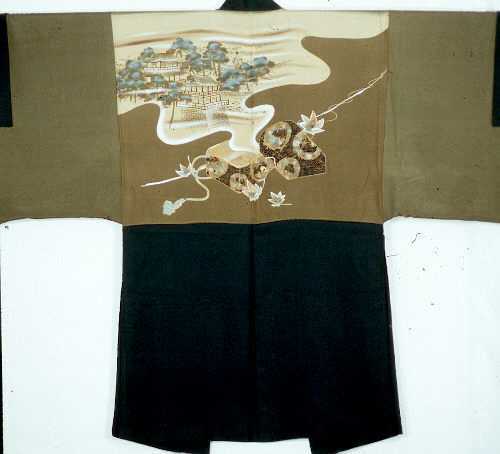 Extraordinary hand woven lustrous Black Silk outer garment with an hand painted Silk lining using the Yuzen Rice Paste Resist technique whereby each individual color had to be applied separately while the remainder were painted out in the rice paste. Each time a new color was added, the garment had to be hand washed in the river before the process began again. Yuzen is marked by a thin white line surrounding each portion of the artwork, signaling an incredible artist at work.